"Run" redirects here. For information on the CPU mode in Brawl, see List of CPU modes. For the Japanese term "Dash Fighter", see Clone. A dash is a form of ground movement faster than walking. It is performed by tapping sideways on the control stick. The player's character enters his or her initial dash animation, in which they change directions with very little lag, and then proceeds to his or her running animation. In Brawl, a character attempting to dash can trip instead. In Smash 4, dashing off a platform will cause the character to perform a short flipping animation, and landing on another platform while continuing to hold the control stick in that direction will allow them to continue dashing. While dashing, characters can also perform their dash attack, shield, or jump. The Bunny Hood, Superspicy Curry, and Super Mushroom items increases a character's running speed. The initial dash is the first part of a character's dash, during which a character can change directions with only 1 frame of lag. The concept of the initial dash is vital to many forms of ground movement, such as dash-dancing, fox-trotting, and pivoting. However, from Brawl onwards, the window for turning around during an initial dash does not last for the entire dash (six frames in Smash 4), making dash-dancing much harder, and fox-trotting is also not entirely dependent on the length of the initial dash. The best example of this is Sheik and Roy, who have nearly identical fox-trots despite Roy's initial dash being over twice as long as Sheik's (17 frames to her 8 frames). The turn-around animation plays when the character attempts to change directions after their initial dash. Unlike in an initial dash, attempting to turn around during a run can take as long as 51 frames (Marth in Melee), and before Smash 4, it can only be cancelled with a jump (and therefore up smash and up special) or reversed side special. However, from Brawl onwards, cancelling the jump with an up smash or up special also reverses its direction, and in Smash 4, the turn-around animation can be cancelled with a reversed forward tilt or forward smash. A stutter step is the term for when a character begins to dash but stops almost immediately, often used for positioning and mindgames. Along with merely stopping, characters can also dash cancel via a variety of other methods. 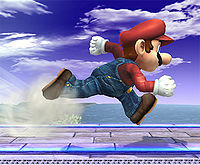 The skidding animation plays when the character stops running after their initial dash and attempts to stop their momentum. The length of this animation varies between characters, but it can also vary depending on the speed the character is running at relative to their maximum running speed. Shorter skidding animations are preferred, particularly in Smash games where dash cancelling is impossible. For example, in Smash 4, Bowser, Charizard, Ganondorf, and Lucario have extremely short skidding animations even after stopping at maximum speed, which effectively allows them to do any attack out of their runs with little lag in between, or even seamlessly begin another dash in the opposite direction. This animation can only be cancelled with a jump, or with an item pick up if one is nearby. Its first few frames can also be cancelled into any special move. Altering the speed of the dash with the control stick, most notably backwards to Moonwalk. Turning around by mashing the control stick in the opposite direction. Turning around takes one frame during which the character is standing and can do all ground attacks except neutral B. If the control stick stays in a neutral position after this pivot frame, the character will keep standing. Pressing A or C-Stick forward/backward during the first 3 frames to do a small step forward smash. This is only possible after dashing forward, not backward. Pressing A after the first 3 frames to do a dash attack. Pressing L or R to shield. During the first two frames of a forward dash, L/R always trigger a roll. On frame 3, they trigger the shield, but with 1 frame delay. Pressing L+A, R+A or Z to do a dash grab. Pressing forward again to enter run break animation. From here you can crouch immediately and do any move. This can be used for a quick dash into dtilt, or a non JC down special. Turning around by mashing or pushing the control stick in the opposite direction. Turning around takes very long, up to 51 frames (Marth). During the turnaround animation, only a jump can interrupt it. Pressing A to do a dash attack. Pressing L or R to shield. Pressing L+A, R+A, or Z to do a dash grab. Running speed is the rate at which a character can run. Starting in Brawl, much like with air acceleration, there exist two acceleration values for each character's initial dash speed until it reaches their run speed: a base value that determines the minimum acceleration, and an additional value that is scaled based on how much the control stick is tilted. A character's maximum potential acceleration is the sum of these two values. For example, Lucario has a base value of 0.04 and an additional value of 0.15, so its dash acceleration can vary from 0.04 at minimum input to 0.19 at maximum input. If the character's initial dash speed is equal to their run speed, the acceleration values are not used, while if it is higher, the character's traction value is used to decrease it down to their run speed. Note that several slow runners can use their dash attack to travel a far distance quicker, and some characters have a DACUS to increase mobility. The most notable case of this is Snake, whose DACUS gives him much more stage control and ability to evade opponents. Run speeds have been buffed across the board for most characters by roughly 10%. Most initial dash speeds are now greater than or equal to that of Cloud's from Smash 4, with the exception of Dr. Mario's intital dash. 1 Sonic 2.31 3.85 ??? ??? ??? 2 Captain Falcon 1.98 2.552 ??? ??? ??? 3 Little Mac 2.365 2.464 ??? ??? ??? 4 Sheik 2.178 2.42 ??? ??? ??? 5 Fox 2.09 2.402 ??? ??? ??? 6 Zero Suit Samus 2.42 2.31 ??? ??? ??? 7 Greninja 2.178 2.288 ??? ??? ??? 8 Mewtwo 2.255 2.255 ??? ??? ??? 9-10 Charizard 2.288 2.2 ??? ??? ??? 9-10 Ridley 1.8 2.2 ??? ??? ??? 11 Cloud 2.145 2.167 ??? ??? ??? 12-13 Roy 2.2 2.145 ??? ??? ??? 12-13 Chrom 2.2 2.145 ??? ??? ??? 14 Meta Knight 2.211 2.09 ??? ??? ??? 15 Palutena 2.035 2.077 ??? ??? ??? 16 Joker 1.9 2.06 ??? ??? ??? 17 Yoshi 1.98 2.046 ??? ??? ??? 18 Pikachu 1.98 2.039 ??? ??? ??? 19 Diddy Kong 2.09 2.006 ??? ??? ??? 20 Bowser 2.255 1.971 ??? ??? ??? 21-22 Marth 2.255 1.964 ??? ??? ??? 21-22 Lucina 2.255 1.964 ??? ??? ??? 23 Inkling 2.118 1.925 ??? ??? ??? 24 Mii Brawler 1.97 1.92 ??? ??? ??? 25 Toon Link 1.914 1.906 ??? ??? ??? 26 Pichu 1.98 1.892 ??? ??? ??? 27 Donkey Kong 2.09 1.873 ??? ??? ??? 28 Wii Fit Trainer 2.024 1.866 ??? ??? ??? 29-30 Pit 2.09 1.828 ??? ??? ??? 29-30 Dark Pit 2.09 1.828 ??? ??? ??? 31 Rosalina & Luma 2.035 1.795 ??? ??? ??? 32 Duck Hunt 1.76 1.793 ??? ??? ??? 33-36 Mario 1.936 1.76 ??? ??? ??? 33-36 Ken 1.936 1.76 ??? ??? ??? 33-36 Bayonetta 1.936 1.76 ??? ??? ??? 33-36 Squirtle 1.936 1.76 ??? ??? ??? 37 Young Link 2.09 1.749 ??? ??? ??? 38 Kirby 1.9 1.727 ??? ??? ??? 39 R.O.B. 2.002 1.725 ??? ??? ??? 40 Piranha Plant 1.82 1.72 ??? ??? ??? 41 Lucario 2.255 1.705 ??? ??? ??? 42 Nana 1.68 1.683 ??? ??? ??? 43 Mr. Game & Watch 1.98 1.679 ??? ??? ??? 44-45 Shulk 1.87 1.672 ??? ??? ??? 44-45 Pac-Man 1.87 1.672 ??? ??? ??? 48-50 Lucas 1.815 1.65 ??? ??? ??? 48-50 Luigi 1.815 1.65 ??? ??? ??? 48-50 Wario 1.837 1.65 ??? ??? ??? 51 Falco 2.035 1.619 ??? ??? ??? 52 Olimar 1.606 1.617 ??? ??? ??? 53 Ness 1.826 1.609 ??? ??? ??? 54 Mega Man 1.958 1.602 ??? ??? ??? 55 Ryu 1.76 1.6 ??? ??? ??? 56-60 Peach 1.826 1.595 ??? ??? ??? 56-60 Daisy 1.826 1.595 ??? ??? ??? 56-60 Corrin 1.892 1.595 ??? ??? ??? 56-60 Ivysaur 1.903 1.595 ??? ??? ??? 56-60 Snake 1.76 1.595 ??? ??? ??? 61 Mii Swordfighter 1.74 1.58 ??? ??? ??? 62 Bowser Jr. 1.76 1.566 ??? ??? ??? 63 Wolf 2.09 1.54 ??? ??? ??? 64 Link 1.98 1.534 ??? ??? ??? 65 Popo 1.68 1.53 ??? ??? ??? 66-67 Simon 1.73 1.52 ??? ??? ??? 66-67 Richter 1.73 1.52 ??? ??? ??? 68 Ike 1.815 1.507 ??? ??? ??? 69 King Dedede 1.815 1.496 ??? ??? ??? 70 King K. Rool 1.936 1.485 ??? ??? ??? 71 Isabelle 1.815 1.48 ??? ??? ??? 72 Zelda 1.958 1.43 ??? ??? ??? 73 Dr. Mario 1.5375712 1.397792 ??? ??? ??? 74 Villager 1.815 1.397 ??? ??? ??? 75 Mii Gunner 1.613 1.37 ??? ??? ??? 76 Ganondorf 1.87 1.34 ??? ??? ??? 77 Jigglypuff 1.65 1.271 ??? ??? ??? 78 Robin 1.815 1.265 ??? ??? ??? 79 Incineroar 1.716 1.18 ??? ??? ??? Wolf and Falco dash slower than Fox, despite being faster than him in Star Fox: Assault. Ike is a generally slow character in the Smash games, despite having good speed stats in Fire Emblem: Path of Radiance and Radiant Dawn. Lucario dashes significantly slower than Pikachu, Ivysaur, and Squirtle (Smash Ultimate) despite the former having the same base Speed stat and the latter two being slower in the Pokémon games. Also, in Pokémon, Mega Lucario gets a slight speed increase, but Mega Lucario runs slower than regular Lucario in Smash 4. King K. Rool is canonically faster than Donkey Kong and Diddy Kong in the Donkey Kong Country games when running away, yet is immensely slower than them in Ultimate. This page was last edited on April 18, 2019, at 12:07.